Why two fish? What kind of pool? Why did I put them there? Did it remind me of anything or any place where I’ve been before? I remembered a former home where we built a small fish pond with a waterfall in the back yard. We filled the little pond with a few beautiful koi and also some feeder goldfish rescued from the bait and tackle shop. It was very relaxing to sit by the pond, watching the fish swim around and come to the surface when we dropped food pellets into the water and sometimes chase each other. It was also a fantastic “in the moment” meditation spot: listening to the sounds of the water, the birds chirping, and the road in the distance. Combined with sweet aromas of water lilies and other garden plant, I would sometimes gently tap on my drum. If conditions were right, at a certain point it all melded together, like being in a symphony with the surroundings. It was such a refreshing experience and warm memory. The images of Pisces showed two fish swimming in opposite directions. But as I created some mock-up pieces, what I painted was less direction-ally defined. For although the two fish are going in opposite directions, they could just as easily turn and chase each other in a playful or frantic circle. I’ve often dreamt of water, either being close to the shore, walking in the waves, or completely submerged and in a different underwater realm. 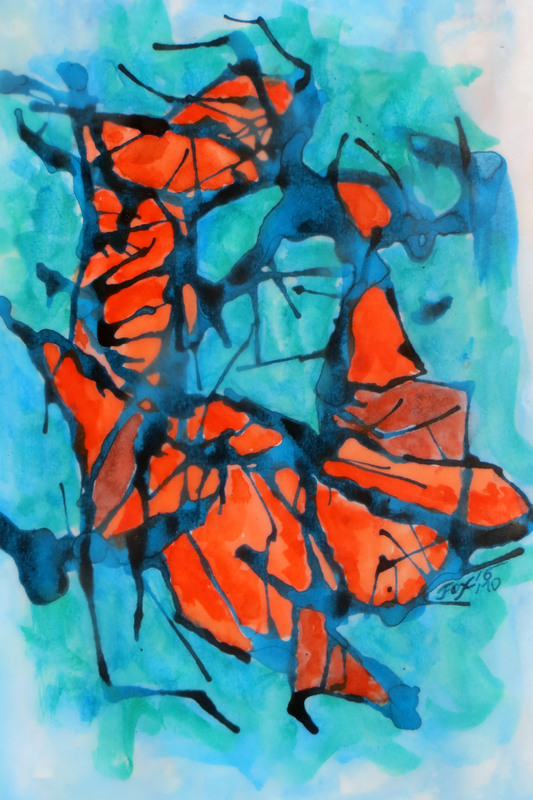 This painting focused on the narrow space, just below the surface of the crystal clear water. A few of my other water-themed encaustic or mixed paintings include: From the Sea (shown), which has a similar vibe, Submerged, Seaside Dancer, Rain Drip, and Cool Water. I also have two acrylic paintings, one of the beautiful southern Oregon shore and one of the Franz Josef Glacier on New Zealand’s South Island. 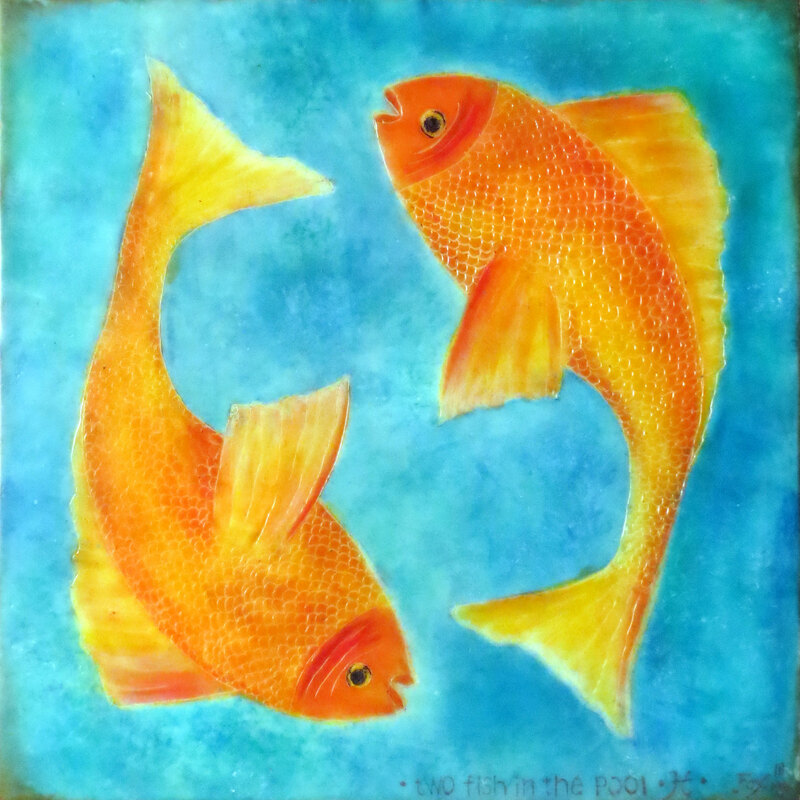 I used my favorite turquoise and copper orange family of colors in this 12″ x 12″ encaustic painting on a cradled board. After carving the scales, fins, and other marks into the encaustic, I filled in with more color. The finishing touches were those sleep-spoken words and, for good measure, a Pisces symbol ♓. ⇒ For information about viewing or purchasing this artwork, contact Janet Fox.